The popular Sunday Siestas event returns this Summer! 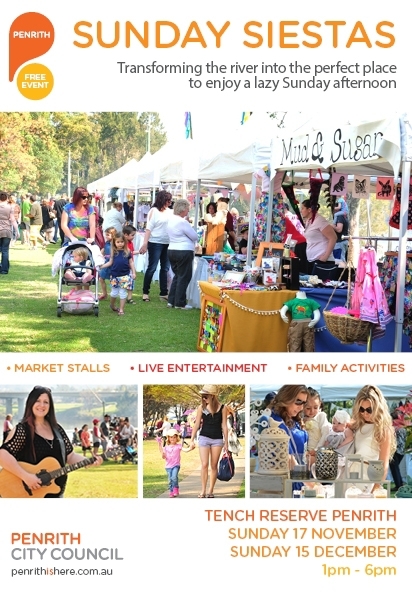 Hosted by the Penrith City Council, the upcoming Summer series of Sunday Siestas will be held on Sunday 17 November and Sunday 15 December 2013, from 1pm to 6pm at Tench Reserve, Penrith. Once again, the family-friendly community event will feature a wide range of quality market stalls, showcasing locally made clothing, candles and arts and crafts, plus live music performances from talented local musicians and bands throughout the afternoon. There will also be activities to keep the little ones entertained and a great array of food stalls on site, so families can enjoy a leisurely lunch or dinner whilst at the event. These unique events provide the community with an opportunity to support local organisations and communities. It is the perfect destination for a lazy Sunday afternoon with friends and family - just make sure to bring a blanket! For more information on 'Sunday Siestas', please visit www.penrithcity.nsw.gov.au or for wet weather advice on the day, contact 1300 736 836.